The Mercedes-Benz SLS AMG (C197 / R197) is a front mid-engine, 2-seater, limited production sports car developed by the Mercedes-AMG division of German automotive manufacturer Mercedes-Benz, with the assistance of David Coulthard. The car, which is the successor to the Mercedes-Benz SLR McLaren and was described by Mercedes-Benz as a spiritual successor to the Mercedes-Benz 300SL Gullwing, mainly because it was inspired by the latter. SLS stands for "Super Leicht Sport" (Super Light Sport). The SLS was the first Mercedes-Benz automobile designed and built from scratch entirely by AMG. 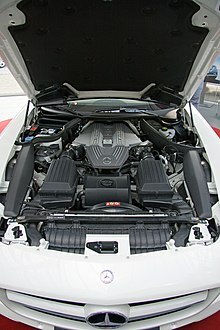 Upon its introduction at the 2009 Frankfurt Motor Show, the SLS AMG's 571 PS (420 kW; 563 hp) M159 engine was according to AMG "the world's most powerful naturally aspirated production series engine" ever produced. An electric version of the car, the SLS AMG Electric Drive, was presented at the 2012 Paris Motor Show. Production ended in 2014 with the introduction of the SLS AMG GT Final Edition. As compared to its predecessor (the Mercedes-McLaren SLR), the SLS is per Mercedes-AMG head Tobias Moers, the faster car on the track, both in the hands of normal drivers as well as race car drivers. The Mercedes-McLaren SLR came in at 1,750 kg (3,858 lb). The SLS, however, has a curb weight of 1,619 kg (3,569 lb) when equipped with the standard wheels. The SLS AMG was designed by Mark Fetherston to be a modern 300SL Gullwing revival from October 2006 to April 2007. The SLS AMG has also adapted the feature of doors that swing open upwards on gas struts, and must be closed manually as AMG engineers decided against the 41 kg (90 lb) of additional weight that auto-closing systems would have added to the car. In case of a roll-over, the doors can be fully detached to allow the occupants to leave the vehicle. Although there is some overlapping in price and performance, the lighter SLS AMG is considered more of a sporty track-oriented car, compared to the Mercedes-Benz SL which is a grand tourer especially with its optional V12 engine. Compared to the SLS AMG Roadster, the SL is a hardtop convertible with technological and comfort amenities, and it also has available heated seats with a massage function. 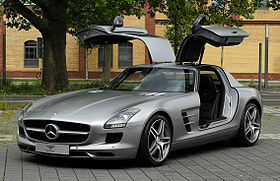 The SLS AMG has also been said to be one of the cheapest cars on the market with an unusual door design. The SLS AMG has won a number of design awards, including the 2010 red dot "best of the best" award, the iF product design award 2010 for the "Transportation Design" category, and the Auto Bild Design Award 2010 as "Europe's most attractive car". It is also the only automobile to have won the gold Design Award of the Federal Republic of Germany. The SLS AMG was assembled largely by hand, with its chassis and aluminum body shell produced by Magna Steyr in Graz, Austria and then transferred to Sindelfingen, Germany for assembly, with its engine being hand built by AMG in Affalterbach, Germany. The SLS AMG was officially introduced at the 2009 Frankfurt Motor Show, and sales commenced in mid-2010 in Europe and in mid-2011 in the United States. The 6.2-litre V8 engine (based on the M156 block) was modified to such an extent that AMG gave it a separate engine code—M159—to signify the more than 120 different modifications done to the engine (as well as the addition of a dry-sump lubrication system to handle the car's high cornering speeds). AMG SPEEDSHIFT DCT 7-speed dual-clutch semi-automatic transmission is connected to engine through a lightweight carbon fiber driveshaft in a transaxle arrangement. Selectable driving modes include "C" (Controlled Efficiency), "S" (Sport), "S+" (Sport plus) or "M" (Manual; allowing the driver to change gears via paddles present on the steering column behind the steering wheel). A true manual transmission is not available. All SLS AMG models except the SLS AMG Electric Drive use the DCT, with the Electric Drive using a two single speed transmissions allowing individual distribution of torque to each wheel. Standard brakes are 390 mm (15.35 in) (front) and 360 mm (14.17 in) (rear) cast iron disc brakes with 6-piston aluminium (front) and 4-piston (rear) calipers. Optional on the SLS AMG are carbon-ceramic disc brakes. 402 mm (15.83 in) discs with 6-piston aluminium calipers (front) and 360 mm (14.17 in) discs with 4-piston calipers (rear). These brakes provide increased stopping power with a 40% weight reduction compared to the standard braking system. The fuel consumption of the SLS AMG is around 13 L/100 km (22 mpg‑imp; 18 mpg‑US) combined driving according to (NEDC, provisional figure). The SLS AMG is capable of accelerating from 0 to 100 km/h (62 mph) in 3.8 seconds (manufacturer claimed), and can reach a top speed of 315 km/h (196 mph). The sports car can also perform a quarter mile time of 11.7 seconds at 201 km/h (125 mph). The SLS AMG achieves a lateral acceleration of 0.99. improving upon the Mercedes-Benz SLR McLaren, which achieves a 0.97 figure. In the June 2010 issue of Car and Driver magazine, safety specifications were revealed pertaining to the safety of the SLS AMG's gullwing doors. Ten to fifteen milliseconds after a detected rollover, explosive bolts situated at the top of the door frame fire and bell cranks separate the doors from the car for easy exit during a serious accident. An anti-lock braking system and a 3-stage Electronic stability program (ESP) are standard equipment. The exterior aluminum body is supplied by Magna Steyr. The SLS and the CL65 AMG 40th Anniversary Edition are the only roadgoing Mercedes-Benz automobiles with the AMG Alubeam Silver exterior paint available, at an extra cost of €11,900 in Germany. Other colours include both metallic and matte colors, such as Designo Magno Kashmir, the matte paint known from the SL63 AMG IWC edition. The SLS AMG has a retractable rear wing which extends at a speed of 120 km/h (75 mph) for stability and handling and acts as an airbrake when braking. The first model introduced in the SLS lineage was the coupé with gullwing doors. In mid-2010, a FIA-GT3 racing version was introduced; and for 2011–2013, Mercedes introduced a roadster version (with conventional doors and a soft top), an electric E-Cell version (coupé), and the ultimate iteration named the Black Series, which has a reduced weight of 300 kg (661 lb). SLS AMG includes 9.5x19-inch (front) and 11x20-inch (rear) AMG 7-spoke light-alloy wheels with 5-twin-spoke wheels and 10-spoke forged wheels available as an option, 265/35 R 19 front and 295/30 R 20 rear tyres, a tyre pressure monitoring system, Formula-1-style LED fog lamp/reversing light, black diffuser insert, dual exhaust tips with chrome finish, an electronically retractable rear wing automatically deployed at a speed of 120 km/h, choice of 9 exterior colours including the AMG ALU-BEAM silver (an approximately US$12,750 option applied at a specialized location in 7 layers by hand after the surface of the car first receives additional polishing and finishing, with each flake of paint aligned to create a gleaming sheen of bluish silver that has the appearance of molten silver, a labour-intensive process that restricted Mercedes to only 2–3 cars finished in that colour per week), designo magno allanite grey (matte), AMG magno sylvanite grey (matte) and Mars Red (metallic), an instrument cluster with LED upshift indicator and two white backlit dials, COMAND APS multimedia system with its 7-inch screen between the two centre air vents, AMG DRIVE UNIT facing the driver, E-SELECT shift lever, Nappa leather upholstery, solid metal and (optional) genuine carbon-fibre trim; choice of five leather colours for the interior upholstery (black, classic red, sand, porcelain and light brown), sports seat backrests made from magnesium, sports seats with two-zone seat cushions and four-way lumbar support and optional Memory package (three configurable individual settings), integrated head restraints and sporty transverse fluting upholstered in designo leather (in optional classic red, sand and porcelain), performance leather steering wheel in a three-spoke design with 365-millimetre rim, a 3.7-litre glove compartment with a spectacles section, a 176-litre luggage compartment, carbon-fibre driveshaft at the rear axle, AMG SPEEDSHIFT DCT 7-speed sports transmission, 3-stage ESP with acceleration skid control system, optional carbon ceramic brakes (an approximately US$12,500 option), and a 1,000 watt stereo system (an approximately US$6,500 option). The initial introduction took place at the 2009 Frankfurt Motor Show, and later at the 2009 Tokyo Game Show, Auto China 2010, and the second terminal of the Haneda Airport. The production model went on sale in spring 2010. Commercial release of the German model began on November 16, 2009. Pre-orders of the Japanese model began on April 14, 2010 with sales beginning from June 10, 2010 and deliveries beginning on September 28, 2010. Various minor changes and variations ensued, as identified below, with a very small gain in horsepower (though the torque remained identical) and in the case of the final edition in model year 2015, certain visual add-ons (a fixed spoiler and carbon-effect). Mercedes-Benz SLS AMG "AMG Desert Gold"
Unveiled at the 2010 Dubai International Motor Show., this variant of the SLS AMG Coupé showcased further customisation options for the SLS AMG including decorative features in shining chrome or Silver Shadow colours, black-painted AMG light-alloy wheels in size 9.5 x 19 at the front and 11.0 x 20 at the rear with a golden ring on the rim flange and a matte gold body colour dubbed "desert gold". Ordered by Mercedes-Benz's Australian subsidiary for the Australian International Motor Show, the Blackbird is a one-off variant of the 2010 Mercedes-Benz SLS AMG Coupé with designo magno Night Black body colour with red highlights. Unveiled at the 2011 North American International Auto Show. the SLS AMG E-Cell is based on SLS AMG Coupé, but is powered by four electric motors that provide a combined power output 392 kW (533 PS; 526 hp) and 880 N⋅m (649 lb⋅ft). The battery is a 400 Volt lithium unit with a capacity of 48 kWh. Other features include pushrod damper struts, 402 x 39 mm (front) and 360 x 32 mm (rear) carbon ceramic brake discs. Full-LED headlamps, AMG 10-spoke light-alloy wheels with smooth-surfaced design, 265/35 R 19 (front) and 295/30 R 20 (rear) tyres, AMG Drive Unit angled towards the driver, sports seats made of quality Nappa leather in a black/white colour combination, performance leather/Alcantara steering wheel and the door linings, centre tunnel. The battery was manufactured by Deutsche Accumotive GmbH & Co. KG, a joint venture between Daimler AG and Evonik Industries AG. The drivetrain has been in development since 2010 as a result of the cooperation between Mercedes-AMG and Mercedes AMG High Performance Powertrains in Brixworth. The SLS AMG GT3 is a race version of SLS AMG Coupé, developed in accordance with the GT3 regulations of the FIA (Fédération Internationale de l'Automobile). Notable changes include a sequential six-speed racing transmission with shift paddles mounted on the steering column, an integrated multi-disc locking differential and traction control, adjustment facilities for the springs and shock absorbers; the suspension height, the stabilisers, the track width and camber; a rack-and-pinion steering with a more direct ratio and servo assistance, AMG 18-inch light-alloy wheels, a steel racing braking system with racing ABS, seat shell (individually foam-padded, featuring the HANS (Head And Neck Support) system located in a high-strength carbon-fibre (CFRP) safety cell, a six-point racing harness, an optimised fire extinguisher system and the central display positioned within the driver's field of vision. The Development of the new Mercedes-Benz SLS AMG GT3 testing programme began on Lausitz Eurospeedway in June 2010. Official introduction took place at the 2010 New York International Auto Show followed by Puebla in Mexico, and the 2010 Pebble Beach Concours d'Elegance. Deliveries began in February 2011, following homologation by the FIA in accordance with the GT3 regulations. 25 SLS AMG GT3's were built for competition with only one not racing in Europe. The SLS AMG Roadster was unveiled at the 2011 Frankfurt International Motor Show. Pre-orders began from 1 June 2011, with its market launch took place in Autumn 2011. The Japanese model went on sale in 21 September 2011. The SLS AMG Ambulance concept showcases the sports car as an emergency vehicle. Unveiled at the 2011 RETTmobil emergency vehicle expo, the concept retained the amenities of the standard car. The car was finished in ALU-BEAM silver metallic exterior colour with decals and emergency lights. It wasn't however revealed whether the car was fitted with specialised equipment. It is a limited version of SLS AMG Coupé for Japan market, commemorating the first year of Mercedes-Benz SLS AMG. It included designo magno Night Black body colour with red highlights at 3-pointed star, grill fin, bonnet fin, SLS/AMG rear emblems, fuel lid (from the Blackbird car); matte black exhaust tip, high gloss black interior trim, leather upholstery in classic red/black, AMG RIDE CONTROL sports suspension, AMG red brake calliper, 19-inch front and 20-inch rear AMG 10-spoke alloy wheels in matte black, AMG performance steering wheel in leather/Alcantara. The vehicle went on sale in September. SLS AMG Roadster Matte Black Edition is a limited (5 units) version of left-drive SLS AMG Roadster for Japan market. Main highlights include designo magno Night Black body colour, classic red/black interior, black soft top, high gloss black interior trim, red paint metal parts (3-pointed star, grill fin, bonnet fin, fender fin, AMG rear/6.3 emblems, fuel lid), matte black exhaust tip, 19-inch front and 20-inch rear AMG 10-spoke alloy wheels in matte black in matte black with red rim, 2-tone leather upholstery, AMG performance steering wheel in leather/Alcantara, Performance Studio floor mat and the AMG RIDE CONTROL sports suspension. SLS AMG Coupé Matte White Edition and SLS AMG Roadster Matte White Edition are limited (10 Coupé, 5 Roadster) versions of left-drive SLS AMG Coupé and SLS AMG Roadster respectively, for Japan market. It included designo magno Cashmere White body colour, porcelain/black interior, black soft top (Roadster only), high gloss black interior trim, matte black paint metal parts (3-pointed star, grill fin, bonnet fin, fender fin, AMG rear/6.3 emblems, fuel lid, door mirror cover), matte black exhaust tip, 19-inch front and 20-inch rear AMG 10-spoke alloy wheels in matte black in matte black, 2-tone leather upholstery, AMG performance steering wheel in leather/Alcantara, Performance Studio floor mat, AMG RIDE CONTROL sports suspension. The models went on sale in May 2012, while deliveries of SLS AMG Roadster Matte Black Edition, SLS AMG Coupé Matte White Edition, SLS AMG Roadster Matte White Edition began in September 2012, October 2012 and October 2012 respectively. Available in Coupé and Roadster body styles, the SLS AMG GT has the same torque (479 lb-ft at 4,750 rpm) and the same top speed as the regular SLS AMG but includes increased engine power output to 591 PS (435 kW; 583 hp) at 6,800 rpm and 650 N⋅m (479 lbf⋅ft) of torque at 4,750 rpm, resulting in an ever so slight 1/10 of a second decrease in 0–97 km/h (60 mph) acceleration time (3.5 seconds to 3.4 seconds) over the prior year model, a reduced transmission reaction time in the manual "M" transmission mode, AMG RIDE CONTROL Performance suspension, selection of suspension modes via AMG DRIVE UNIT, 3 additional AMG light-alloy wheels options, Alcantara black interior upholstery, red seat belts, contrasting stitching on the AMG sports seats and the centre console and the door panel lining in red, floor mats in red edging, high-gloss black AMG trim on the centre console and door panel, high-gloss black edging on the adjustable cross-shaped air vents and the high-gloss real metal insert on the AMG Performance steering wheel with Alcantara grip, AMG instrument cluster with black faceplate, AMG designo Exclusive Style leather option (a diamond design with contrasting stitching, designo leather finish for the entire dashboard, the beltlines and door armrests, the handrest on the centre console, AMG floor mats in black with porcelain leather edging, roof lining in Alcantara porcelain, and the parcel shelf (Coupé) or roll-over bar (Roadster)) in 3 colour combinations (mocha brown/porcelain, titanium grey pearl/porcelain, mystic red/porcelain). Other options include AMG carbon-fibre exterior mirrors, AMG carbon-fibre engine compartment cover, AMG Interior Carbon-Fibre package (carbon-fibre trim, trim on seat backrest and side, door sill panels), AMG ceramic high-performance composite braking system, AMG Performance Media, AMG 10-spoke forged wheels in various colours, AMG carbon-fibre exterior package, AIRSCARF (Roadster) and Bang & Olufsen BeoSound AMG surround sound system. The SLS AMG GT completed the Nürburgring Nordschleife in under 7 minutes 30 seconds. The market launch began in October 2012. US models went on sale in mid- November 2012 as 2013 model year vehicles, replacing previous SLS AMG versions. Japanese models went on sale on 30 November, 2012, with deliveries starting in March 2013. Unveiled at the 2012 São Paulo International Motor Show, the SLS AMG GT3 "45th ANNIVERSARY" is a limited (5 units) version of SLS AMG GT3 commemorating the 45th anniversary of AMG brand. Main highlihts included designo magno graphite matte body colour, a seat shell in a high-strength carbon-fibre safety cell on the co-driver's side, carbon fibre reinforced plastic doors, bonnet, mudguards, boot lid, rear wings, front and rear apron, front splitter and rear diffuser. The engines for SLS AMG GT3 "45th ANNIVERSARY" were installed by Bernd Schneider. The Black Series is 70 kg (154 lb) lighter than the standard model. This is accomplished by increased use of carbon fibre in body panels, mechanical components, and the space frame. Further, a switch from steel to titanium for the exhaust system reduces weight by 13 kg (29 lb). The use of lithium-ion battery reduces weight by 8 kg (18 lb). The AMG SpeedShift DCT 7-speed sports transmission is installed 10 mm (0.39 in) lower in order to achieve a lower centre of gravity for the car and is braced against the body by gas-filled struts in order to avoid stress cycles. The transmission's "Sport plus" and "Manual" modes have faster shifting speed than the standard model. The downshifting throttle blips are more audible. The new temporary "M" mode enables the driver to activate manual mode without having to remove a hand from the steering wheel, by pressing the "up" or "down" shift paddle once. Other notable highlights include electronically controlled AMG rear-axle differential lock with a shorter rear-axle ratio, new AMG RIDE CONTROL performance suspension (tauter basic tuning and electronically controlled two-stage damping, coil-over spring retainers to enable adjustment of wheel loads, elastokinematics 50 / 42% more rigid (front/rear axle), track width increased by 20 / 24 mm (0.79 / 0.94 in) (front/rear axle)), new wheel carriers on front axle and new front stabiliser tuning, matte black with high-sheen AMG 10-spoke light-alloy wheels in particularly light forged design with optimised strength (10 in × 19 in (250 mm × 480 mm) front, 12 in × 20 in (300 mm × 510 mm) rear), Michelin Pilot Sport Cup 2 sports tyres (275/35 R 19 front, 325/30 R 20 rear), AMG speed-sensitive steering with newly calibrated power steering characteristics, AMG ceramic brake discs (measuring 402 mm × 39 mm (15.8 in × 1.5 in) at the front and 360 mm × 32 mm (14.2 in × 1.3 in) at the rear) with increased hardness, wide flared wings with an added width of 13 mm (0.51 in) (front) and 26 mm (1.0 in) (rear) on each side, darkened headlamps and black surrounds for the rear lights, front apron and rear apron with diffuser along with side sill panels in Black Series-specific design (carbon fibre-reinforced plastic front splitter, carbon inserts in the side sills and the rear apron made of carbon fibre, enlarged air intakes with carbon-fibre flics), carbon-fibre bonnet with central air outlet, Alcantara black or Alcantara black/red interior AMG Performance steering wheel with Alcantara upholstery, metal bezel features a high-gloss black paint finish to match the high-gloss black surrounds of the air vents, Alcantara strip in anthracite across the entire width of dashboard leather with red contrasting stitching in the leather, designo leather and Alcantara upholstery (including bottom section of the dashboard, door centre panels and on the AMG sports bucket seats in Alcantara), deleted COMAND APS multimedia system replaced by a carbon-fibre trim element (COMAND APS is optionally available), AMG DRIVE UNIT, red seat belts and red contrasting stitching on the AMG sports bucket seats, the upper and lower section of the dashboard and the door panelling; floor mats with red edging and optional Bang & Olufsen BeoSound AMG surround sound system. Other options include AMG carbon-fibre wing mirrors, AMG carbon-fibre engine cover, AMG Interior Carbon-Fibre package, AMG infotainment system (incl. COMAND APS, AMG Performance Media and backup camera), Media Interface. The US model went on sale in summer 2013 as 2014 model year vehicle. The SLS AMG Electric Drive is a limited edition electric variant of the SLS AMG introduced in June 2013. The production version was unveiled at the 2012 Paris Motor Show, with market launch initially scheduled for June 2013. Pricing in Germany began at €416,500 (~ US$544,236). Fewer than 100 units were sold. Following the introduction of the SLS AMG E-CELL prototype, the production of SLS AMG E-CELL was originally announced at the 2011 North American International Auto Show. The SLS AMG Electric Drive was powered by four electric motors with combined ratings of 552 kW (751 PS; 740 hp) and 1,000 N⋅m (738 lb⋅ft). Each motor can spin up to 13,000 rpm and weighs 45 kg (99 lb). In addition, the transmission allows each motor to selectively drive all 4 wheels. This enables the car to accelerate from a stand still to 100 km/h (62 mph) in 3.9 seconds. The SLS AMG Electric Drive included a liquid-cooled 400 V lithium-ion battery rated to 60 kWh that delivers a range of 250 km (160 mi) under the combined New European Driving Cycle. The 548 kg (1,208 lb) battery pack is made up of 12 modules, each comprising 72 lithium-ion cells. The system was designed as a collaboration between Mercedes-AMG and Mercedes AMG High Performance Powertrains Ltd. Available in both Coupé and Roadster body styles, the SLS AMG GT final edition is the final limited production iteration (350 units total, 25 in Japan) of the SLS AMG GT. Features includes an exposed carbon fibre hood with central air outlet, carbon fibre front splitter on the front apron, fixed carbon fiber rear spoiler from the SLS AMG Coupé Black Series, the choice of 2 exclusive AMG forged light-alloy wheels (inlaid in matte black with the spokes and rim flange in a high-sheen finish, completely painted matte black highlighted by a pencil thin high-sheen rim flange), designo magno graphite matte body colour (from the SLS AMG GT3 "45th ANNIVERSARY"), struts of the rear apron in high-gloss black, red-painted brake callipers, 265/35 R 19 (front) and 295/30 R 20 (rear) Dunlop Sport Maxx Race Cup tires as a no-cost option, designo Exclusive leather upholstery in a diamond-stitch pattern at centre panels of both the seats and the doors, contrasting topstitching in silver with black leather upholstery, silver seat belts, black floor mats edged in silver leather, high gloss carbon fiber trim, "AMG FINAL EDITION – 1 of 350" badge on the carbon fibre centre console, 3D seam (a fine strip of Alcantara) set into the leather-covered upper dashboard, contrasting topstitching in silver at 3D seam, AMG Performance steering wheel in Alcantara with a silver 12 o'clock marking and black metal inserts, high-gloss black surrounds of the air vents, sports seats with an embossed AMG crest in the head restraints. The "Final Edition" changes do not result in any quantifiable performance difference over the prior year model. Horsepower, torque, acceleration times and top speed are all identical. Other options include Carbon Fibre wing mirrors, Extended Interior Carbon Fibre package (additional carbon-fiber trim on seat backrest and side, as well as door sill panels), AMG Carbon-Ceramic High-Performance braking system, AMG Performance Media and Bang & Olufsen BeoSound AMG surround sound system. The car was unveiled first at the 2013 Los Angeles Auto Show and the 2013 Tokyo Motor Show, followed by the 2013 Osaka Motor Show. Market launch was set to begin in March 2014. The Japan model was set to be delivered in June 2014, which included 20 Coupés, 5 Roadsters, the choice of 6 body colours (Fire Opal solid, Obsidian Black metallic, Elysium Silver metallic, AMG Imola Grey (premium), designo Magno Graphite (matte) (premium), designo Mystic White 2 (premium)), black designo Nappa full leather interior upholstery with silver diamond pattern stitching at door centre panel, seat centre; anthracite roof liner, choice of 3 soft top colours for Roadster (black, beige, red), carbon fibre wing mirrors, Bang & Olufsen BeoSound AMG sound system and optional AMG Carbon-Ceramic brake discs. The SLS AMG was used as the official Safety Car in Formula One in the 2010, 2011 seasons and part through the 2012 season when it was replaced by the SLS AMG GT variant, which remained on duty up to the 2014 season coinciding with the end of production of the SLS. The SLS AMG E-CELL competed in Paul Pietsch Classic 2011 under the 'Classic meets Future' category. The SLS AMG E-CELL was competed in the 2011 Silvretta electric car race that took place in the Montafon region of Austria. SLS AMG GT3 first competed in the 2010 VLN Nürburgring Endurance Championship. At VLN Nürburgring, the SLS AMG GT3 was admitted into the SP9 class with "Balance of Performance" set to 1,350 kg (2,976 lb) and 556 PS (409 kW; 548 hp), and won its first race in October. Since its launch in 2010, the SLS AMG GT3 has been competing in GT competitions around the world, such as the FIA GT3 European Championship, Blancpain Endurance Series, Blancpain Sprint Series, VLN, 24 Hours of Nurburgring, British GT Championship, Super GT, Australian GT Championship, Bathurst 12 Hour, Dubai 24 Hour, Macau GT Cup and Pirelli World Challenge. Also, the SLS AMG GT3 is used in the AMG Driving Academy programme. The car won the 2012 and 2013 Dubai 24 Hour under Black Falcon Racing. Erebus Racing has raced it in the Australian GT Championship, driven by Peter Hackett who is also the Chief Instructor at the Australian Mercedes Benz Driving Academy. The SLS AMG GT3 competed in the Goodwood Festival of Speed 2011. Black Swan Racing and DragonSpeed currently uses the SLS AMG GT3 in the SCCA Pirelli World Challenge. An SLS took part in the 2012 Super GT season, with drivers Haruki Kurosawa and Hironori Takeuchi coming joint 5th in the GT300 drivers' championship. Five cars competed in the 2013 season. An SLS won the 2013 Liqui Moly Bathurst 12 Hour, entered by Erebus Motorsport. An SLS set the fastest lap, and won the 2013 24 Hours of Spa, taking the first Mercedes win in the race since 1964. Mercedes-Benz SLS AMG branded shoes were produced and sold in collaboration with Italian designer Santoni. As part of the SLS AMG's market launch, a print ad (started in February 2010) featured a red Mercedes-Benz SLS AMG striking a powerful pose on grey asphalt against a black backdrop. The visual motif is supported by a brief, meaningful message, such as "Oh Lord …" or "A cockpit. An engine. Two wings. Is it still a car? ", for example. The print ad appeared in daily newspapers and magazines. A TV advert with Michael Schumacher telling the story of an experiment with the SLS AMG demonstrating its technical highlights from preparation and test phases to the realisation was produced. The TV ad was premiered on 30 January 2010 on all major television channels with a 60-second roadblock, followed by a 45-second version in reruns until the end of March. The Mercedes-Benz SLS AMG website was extended with the addition of an interactive guided tour of the AMG development plant. In addition, three editions of an online magazine provided extensive information on the performance ("Milliseconds"), the lightweight construction ("Milligrams") and the design ("Millimetres") of the SLS AMG. A reporter blog www.sls-amg-reporter.de was launched featuring fictional enthusiast Matthew K. posting reports, pictures and video clips of his travels as an SLS AMG reporter as he follows the global launch of the new gullwing. Starting at February 2010, a new iPhone application called "SLS AMG" was launched, featuring a preview of the car via 360° gameplay using the iPhone's accelerometer. SLS AMG also appeared in Gran Turismo 5, scheduled for release in 2010. Cigarette 46' Rider, a boat inspired by SLS AMG and built by Cigarette Racing, was unveiled in 2010 the Miami International Boat Show. In 2011, the SLS was featured on the 16th series of Top Gear. The 2013 SLS Roadster was then reviewed two years later. As part of SLS AMG Roadster launch in the UK, a video featuring David Coulthard catching a speeding golf ball hit by professional golfer Jake Shepherd with Mercedes-Benz SLS AMG Roadster was produced, and was independently verified by a Guinness World Record adjudicator as title of farthest golf shot caught in a moving car. Minichamps produced a limited (197 units) edition of SLS AMG GT3 1:18 scale model car for the IAA 2013. The vehicle includes 88 parts, painted in matt black and features poison green details. As part of its US marketing, the SLS AMG was also used at the 2009 AMG Driving Academy season for its Stage 1. Production of the SLS AMG began at Sindelfingen in January 2010. Sales commenced in mid-2010 in Europe and in mid-2011 in the United States. Production ended with the SLS AMG GT Final Edition in early 2014. A total of 2,734 SLS AMGs were sold in the U.S., including both Gullwings and roadsters. According to a post on mbworld.org by a Mercedes-Benz executive, total U.S. sales of SLS AMG's several months earlier were as follows: 1,837 coupés and 884 roadsters. The SLS AMG was followed in 2014 by the substantially less expensive, and less powerful, Mercedes-AMG GT. Designed to compete against the Porsche 911, it relies on forced induction for its power and is available as a 462 PS (340 kW; 456 hp) GT and 510 PS (375 kW; 503 hp) GT S. AMG/Mercedes does not plan to replace the SLS any time soon, with AMG head Tobias Moers being quoted as follows in 2015: "Moers was adamant in reiterating that a true replacement for the modern Gullwing is not yet on the radar. 'Honestly, there's no [Mk II SLS] program running. Our homework for the next years is so much, so we took the decision to not replace directly the SLS because SLS has to stand by its own and the Gullwing is an iconic car.[...] If it takes 50 to 60 years to have a Gullwing replacement coming out of the 1950s then we can wait a few more years' [to replace the SLS Gullwing]." Moers was also quoted as follows: "Speaking to Autocar at the (2015) Geneva Motor Show, Mercedes-AMG boss Tobias Moers confirmed that the company has no plans to create a new supercar to replace the SLS. According to Moers, Mercedes is 'not in that league' at this moment in time." As summed up by Moers, the "SLS AMG has won numerous awards of international significance. Not least on the basis of its breathtaking design and acknowledged superb driving dynamics, the super sports car from Mercedes-AMG is today already determined to be a classic of the future," and particularly the "spectacular gullwing model," with these cars made more special by virtue of their also being "the first vehicle to be completely built by Mercedes-AMG." The SLS AMG was developed with the assistance of David Coulthard. In his review for Top Gear, Jeremy Clarkson praised the SLS AMG highly, saying it is "the greatest car in the world," noting that "it's more powerful than a Ferrari 458, louder than a Lamborghini, and it's way more fun than the 911RS GT Turbo 3S or whatever this week's ultimate Beetle (i.e., Porsche) is called. This is the thinking man's supercar." ^ Tony Quiroga (September 2011). "2012 Mercedes-Benz SLS AMG Roadster; Without gullwing doors, the SLS AMG is every bit as enthralling, maybe even more so". Car and driver. Retrieved 6 April 2018. ^ Eric Tingwall (March 2013). "2014 Mercedes-Benz SLS AMG Black Series; Mercedes' crown jewel becomes a black diamond". Car and driver. Retrieved 6 April 2018. ^ "Mercedes-Benz revives its classic Gullwing two-seater as the SLS". Autoweek.com. 2009-02-03. Retrieved 2012-01-06. ^ a b c d "Mercedes-Benz SLS AMG: high-tech and fascination – The new 'Gullwing' from Mercedes-Benz" (Press release). Mercedes-Benz. 2009-12-03. Retrieved 2012-09-19. ^ a b c Damon Lowney. "Mercedes SLS AMG GT Final Edition marks end of AMG's first sports car". Autoblog. ^ Motor Trend, "What AMGs Dev Chief thinks about SLS, SLR, etc.," by Edward Loh, November 2, 2009. ^ "The Mercedes SLR McLaren," Mercedes-Benz Club of America, Orange County, http://www.mboc.info/cars-slr. ^ "True Brit: the Merc SLS AMG – BBC Top Gear". Topgear.com. 2011-12-16. Retrieved 2012-09-05. ^ "Mercedes-Benz Club of America, Orange County". Mboc.info. 2009-03-12. Retrieved 2012-09-05. ^ a b c Vettraino, J.P. (November 30, 2009). "Better Than the Original?". AutoWeek. Detroit, Michigan: Crain Communications Inc. 59 (24): 23. ISSN 0192-9674. ^ Schultz, Jonathan (2012-03-20). "2013 SL65 AMG Muscles In on SLS AMG Roadster - NYTimes.com". Wheels.blogs.nytimes.com. Retrieved 2012-05-11. ^ Michael Bettencourt (2012-04-03). "2013 Mercedes-Benz SL 550: A luxury retreat". The Globe and Mail. Retrieved 2012-05-11. ^ examiner.com, May 31, 2010; Mercedes-Benz Brunei – Design – Awards. ^ Daimler Brands & Products, Global Media Site, November 2, 2010. ^ a b "2010 Mercedes-Benz SLS AMG photo gallery". Ausmotive.com. Retrieved 2012-01-06. ^ Road & Track, April 2, 2014, by James Wolfcale. ^ Sam Abuelsamid RSS feed (2009-04-08). "New York: Mercedes-Benz AMG SLS – new sketches, interior revealed". Autoblog.com. Retrieved 2012-01-06. ^ "Electric Mercedes-Benz SLS AMG Coming In 2013". Motor Authority. Retrieved 14 November 2018. ^ "Mercedes-Benz SLS AMG: The New 'Gullwing'". Automoblog.net. ^ TopSpeed, "2010 – 2012 Mercedes-Benz SLS AMG." ^ Juergen Zoellter (2009-09-01). "2011 Mercedes-Benz SLS AMG – First Drive Review". Car and Driver. Retrieved 2010-12-25. ^ Edmunds, "2013 Mercedes-Benz SL65 AMG vs. 2013 Mercedes-Benz SLS AMG GT," March 20, 2013. ^ "倉岡千尋のセリフキャリア日報". Retrieved 13 January 2019. ^ "Magna to Supply Mercedes' SLS AMG Body". autoevolution. Retrieved 2009-11-10. ^ "Mercedes-Benz SLS AMG E-CELL: the zero-emission gullwing". auto123.com. Retrieved 14 November 2018. ^ Popular Mechanics, "8 Absurdly Expensive Paint Jobs;" Autoblog 6/5/10, "Mercedes-Benz SLS AMG Available in Alubeam – If You Have Patience"
^ "The new Mercedes-Benz gullwing at the Tokyo Game Show: Mercedes-Benz SLS AMG in Gran Turismo®5 – Daimler Global Media Site > Brands & Products > Mercedes-Benz Cars > Mercedes-AMG > SLS AMG > Coupé". daimler.com. 31 October 2014. ^ "Mercedes-Benz at Auto China 2010: World premiere of the Concept Shooting Break and four new models for the Chinese car market". Retrieved 13 January 2019. ^ "Mercedes-Benz at "Auto China 2010": World premiere of the Concept Shooting Break – Daimler Global Media Site > Home". daimler.com. 6 July 2011. ^ "羽田空港第2 ターミナルにSLS AMG ショーケースが出現" (PDF). Retrieved 13 January 2019. ^ "Mercedes-Benz SLS AMG: fascination and high tech: The new 'Gullwing' from Mercedes-Benz – Daimler Global Media Site > Brands & Products > Mercedes-Benz Cars > Mercedes-AMG > SLS AMG > Coupé". daimler.com. 31 October 2014. ^ John Neff. "Gullwing Returns: Official details on Mercedes-Benz SLS AMG". Autoblog. ^ Jonathon Ramsey. "Mercedes-Benz SLS AMG priced for Europe, now taking orders". Autoblog. ^ ""メルセデス・ベンツの新型スーパースポーツカー SLS AMGの予約注文を受付開始"" (PDF). Retrieved 13 January 2019. ^ "メルセデス・ベンツの新型スーパースポーツカー「SLS AMG」を発売" (PDF). Retrieved 13 January 2019. ^ "メルセデス・ベンツの新型スーパースポーツカー 「SLS AMG」の納車を開始" (PDF). Retrieved 13 January 2019. ^ Sam Abuelsamid. "Mercedes-Benz SLS goes from zero to gold in seconds for Dubai show". Autoblog. ^ "mayuresh". Smh.drive.com.au. Retrieved 2012-01-06. ^ Noah Joseph. "Mercedes shows C63 and SLS AMG specials in Australia". Autoblog. ^ Zach Bowman. "Detroit 2011: Mercedes-Benz SLS AMG E-Cell is the color of electric hotness". Autoblog. ^ a b "SLS AMG E-CELL: the high-voltage gullwing" (Press release). Mercedes-Benz. 5 July 2010. Retrieved 27 September 2012. ^ Jonathon Ramsey. "Frankfurt 2009: Mercedes-Benz SLS AMG comes dressed in red and, soon, electric". Autoblog. ^ Autoblog Staff. "Mercedes-Benz SLS AMG E-Cell reveals its inner workings". Autoblog. ^ "Mercedes-Benz at the 2010 New York International Auto Show: World premiere of the new-generation R-Class and model offensive on the U.S. market – Daimler Global Media Site > Home". daimler.com. 8 September 2014. ^ a b "2010: the Mercedes-Benz SLS AMG – Daimler Global Media Site > Classic > Mercedes-Benz Cars > Mercedes-Benz Passenger Cars > Super-sports cars". daimler.com. 14 May 2010. ^ Frank Filipponio. "Monterey 2010: Mercedes-Benz SLS AMG GT3 shines in silver". Autoblog. ^ "Sales launch for the SLS AMG GT3: Ready for the off – the gullwing model for the racetrack – Daimler Global Media Site > Brands & Products > Mercedes-Benz Cars > Mercedes-AMG > SLS AMG > Coupé". daimler.com. 31 March 2011. ^ "Mercedes SLS GT3 set to be Unveiled". gt3europe.com. FIA GT3 European Championship. 2010-03-26. Retrieved 2010-03-28. ^ Jeff Glucker. "Video: 2011 Mercedes-Benz SLS AMG GT3 looks and sounds evil, priced around $550k". Autoblog. ^ Jeff Glucker. "2012 Mercedes-Benz SLS AMG Roadster trades gullwings for a soft-top". Autoblog. ^ "Development of the new Mercedes-Benz SLS AMG Roadster – Revelation: stable even without gullwings – Daimler Global Media Site > Brands & Products > Mercedes-Benz Cars > Mercedes-AMG > SLS AMG > Roadster". daimler.com. 31 October 2014. ^ "2012 Mercedes-Benz SLS AMG Roadster unveiled". AutoBlog. AOL. Retrieved 9 October 2012. ^ "Mercedes-Benz SLS AMG Roadster Officially Breaks Cover". 0–60 Mag. Retrieved 8 June 2011. ^ "The Mercedes-Benz SLS AMG Roadster – Open sensuality: roadster performance in its perfect form – Daimler Global Media Site > Brands & Products > Mercedes-Benz Cars > Mercedes-AMG > SLS AMG > Roadster". daimler.com. 31 October 2014. ^ "SLS AMG ロードスターを発売" (PDF). Retrieved 13 January 2019. ^ Noah Joseph. "Mercedes-Benz showcases SLS AMG ambulance concept at emergency vehicle expo". Autoblog. ^ "SLS AMG Matte Black Edition を限定発売" (PDF). Retrieved 13 January 2019. ^ "SLS AMG Matte Editionを限定発売" (PDF). Retrieved 13 January 2019. ^ AUSTIN LINDBERG (June 2012). "2013 Mercedes-Benz SLS AMG GT Coupe and Roadster". Car & Driver. Hearst Corporation. Retrieved 9 October 2012. ^ Matt Davis. "2013 SLS AMG GT changes detailed, new car obliterates Nürburgring in under 7:30". Autoblog. ^ "The new SLS AMG GT: Enhanced driving dynamics – Daimler Global Media Site > Brands & Products > Mercedes-Benz Cars > Mercedes-AMG > SLS AMG > Coupé". daimler.com. 17 July 2012. ^ Steven J. Ewing. "2013 Mercedes-Benz SLS AMG GT ups the supercar stakes". Autoblog. ^ "スーパースポーツカー「SLS AMG GT」を追加発売" (PDF). Retrieved 13 January 2019. ^ "World premiere at the 2012 São Paulo International Motor Show: SLS AMG GT3 "45th ANNIVERSARY" – Daimler Global Media Site > Brands & Products > Mercedes-Benz Cars > Mercedes-AMG > SLS AMG > Coupé". daimler.com. 22 October 2012. ^ Zach Bowman. "Mercedes launches SLS AMG GT3 45th Anniversary racecar". Autoblog. ^ "Limited-edition customer sport racing car to mark the 45th birthday: Exclusive collector's item – The new SLS AMG GT3 "45th ANNIVERSARY" – Daimler Global Media Site > Brands & Products > Mercedes-Benz Cars > Mercedes-AMG > Motorsports > Customer sports". daimler.com. 23 October 2012. ^ Viknesh Vijayenthiran. "Mercedes SLS AMG GT3 45th Anniversary Edition Track Video". Motor Authority. ^ "Los Angeles Auto Show 2012: Three world premieres from Mercedes-Benz – Daimler Global Media Site > Brands & Products > Mercedes-Benz Cars > smart > Industry trade shows and events". daimler.com. 16 December 2013. ^ "Mercedes Benz SLS AMG Black Series". Retrieved 13 January 2019. ^ "The new Mercedes-Benz SLS AMG Coupé Black Series: GT3 performance for the road" (Press release). Daimler AG. 9 November 2012. Retrieved 9 November 2012. ^ a b "2014 Mercedes-Benz SLS AMG Black Series". Car and Driver. Retrieved 14 November 2018. ^ "2013 Mercedes-Benz SLS AMG GT Coupe". Car and Driver. Retrieved 14 November 2018. ^ Jeffrey N. Ross. "Mercedes-Benz finally reveals SLS AMG Black Series". Autoblog. ^ a b "Mercedes-Benz SLS AMG Coupé Electric Drive: Electrifying – the world's most powerful electric super sports car" (Press release). Mercedes-Benz. 27 September 2012. Retrieved 27 September 2012. ^ "Mercedes-Benz and smart at the Mondial de l'Automobile 2012 in Paris: "Electric Drive" for all eventualities – three world premieres in Paris – Daimler Global Media Site > Brands & Products > Mercedes-Benz Cars > smart > Industry trade shows and events". daimler.com. 3 July 2014. ^ Daimler Media. "Daimler Outlook". Daimler. Archived from the original on 2013-05-26. Retrieved 2013-04-14. ^ David Szondy (2012-09-28). "Mercedes-Benz SLS AMG Coupé Electric Drive – the world's fastest production electric supercar". Gizmag. Retrieved 2013-04-14. ^ Siu, Jason (2016-10-13). "Audi Quietly Discontinues All-Electric R8 E-Tron – Again". HybridCars.com. Retrieved 2016-10-13. ^ "Mercedes-Benz at the NAIAS 2011 in Detroit – Fascination of electric mobility. SLS AMG E-CELL: Electric super sports car enters series production. B-Class F-CELL: With hydrogen around the world". Retrieved 13 January 2019. ^ Daimler Media (2012-09-27). "Mercedes-Benz at the 2012 Paris Motor Show: Four world premieres". Daimler. Retrieved 2013-04-14. ^ "SLS AMG GT FINAL EDITION". Retrieved 13 January 2019. SLS AMG GT FINAL EDITION". mercedes-amg.com. ^ Automobile, 11/20/2013; Autoweek, 11/20/2013; Car & Driver, 11/20/2013; Motor Authority, 11/20/2013. ^ "The Safety Car". FIA. 2015. Retrieved 3 April 2015. ^ "Mercedes-Benz at the Geneva International Automobile Salon 2010: Efficiency can be this dynamic – Mercedes-Benz launches "Formula Green" in the five, four and three-litre consumption class – Daimler Global Media Site > Brands & Products > Mercedes-Benz Cars > Mercedes-Benz Passenger Cars > Special Topics". daimler.com. 6 July 2011. ^ "Mercedes unveils new gull-wing safety car". ESPN F1. ^ "High-performance cars from Mercedes-AMG ensure safety: SLS AMG and new C 63 AMG Estate on standby in the Formula 1 World Championship – Daimler Global Media Site > Brands & Products > Mercedes-Benz Cars > Mercedes-AMG > Motorsports > Safety Car / Medical Car". daimler.com. 31 October 2014. ^ "SLS AMG and C 63 AMG Estate continue F1 roles: Mercedes-AMG enters 17th season as Official F1 Safety Car and Official F1 Medical Car – Daimler Global Media Site > Brands & Products > Mercedes-Benz Cars > Mercedes-AMG > Motorsports > Safety Car / Medical Car". daimler.com. 15 March 2012. ^ "Mercedes unveils new 2015 safety and medical cars". Formula1.com. Formula One Administration. 6 March 2015. Retrieved 8 March 2015. ^ "Safety Car". www.formula1-dictionary.net. Retrieved 13 January 2019. ^ "Mercedes-Benz premium partner of the Paul Pietsch Classic: Classic car rally to mark 100th birthday". Retrieved 13 January 2019. ^ "More driving pleasure in high mountain regions: Daimler fields seven electric cars for the 2011 Silvretta electric car race". Retrieved 13 January 2019. ^ "Gullwing takes to the racetrack for the first time: Racing debut for the SLS AMG GT3 on the legendary Nürburgring "Nordschleife" – Daimler Global Media Site > Brands & Products > Mercedes-Benz Cars > Mercedes-AMG > SLS AMG > Coupé". daimler.com. 31 March 2011. ^ "Debut for the racing version of the gullwing model at the VLN race: Racetrack premiere for the SLS AMG GT3 on the Nürburgring "Nordschleife" – Daimler Global Media Site > Brands & Products > Mercedes-Benz Cars > Mercedes-AMG > SLS AMG > Coupé". daimler.com. 31 October 2014. ^ "VLN Langstreckenmeisterschaft Nürburgring – Black Falcon holt ersten Mercedes-Sieg seit 1998" (in German). Vln.de. 2010-10-16. Retrieved 2012-01-06. ^ "The AMG Driving Academy programme in detail: From EMOTION to SLS AMG GT3 COMPETITION – Daimler Global Media Site > Brands & Products > Mercedes-Benz Cars > Mercedes-AMG > AMG Driving Academy". daimler.com. 14 March 2012. ^ "SLS AMG GT3 now part of the AMG Driving Academy vehicle line-up: Pushing driving performance to the limits with the SLS AMG GT3 – Daimler Global Media Site > Brands & Products > Mercedes-Benz Cars > Mercedes-AMG > AMG Driving Academy". daimler.com. 9 September 2011. ^ "Australian GT driver profile – Peter Hackett". Australiangt.com.au. 1977-09-17. Retrieved 2012-01-06. ^ "The vehicles at the hillclimb – Daimler Global Media Site > Classic > Mercedes-Benz Classic > Events". daimler.com. 29 June 2011. ^ Noah Joseph. "Santoni crafts driving shoes for the Mercedes-Benz SLS AMG". Autoblog. ^ ""Is it still a car? ": The campaign for the Mercedes-Benz SLS AMG – Daimler Global Media Site > Brands & Products > Mercedes-Benz Cars > Mercedes-AMG > SLS AMG > Coupé". daimler.com. 31 October 2014. ^ Jeremy Korzeniewski. "In Hot Water: Cigarette Racing boat inspired by Mercedes-Benz SLS AMG". Autoblog. ^ "Frankfurt 2011: Mercedes F125!". ^ "Jeremy drives the Mercedes SLS Roadster (Series 18, Episode 2)". ^ "GUINNESS WORLD RECORD: DAVID COULTHARD CATCHES FARTHEST HOLE IN ONE WITH SLS AMG ROADSTER – Daimler Global Media Site > Company > Sponsorship > Sport Sponsorship > Golf". daimler.com. 31 October 2014. ^ "David Coulthard catches 178 mph golf ball in Mercedes SLS AMG Roadster [Video]". torquenews.com. ^ Chris Paukert. "Mercedes-Benz CLA gets personal". Autoblog. ^ Noah Joseph. "Coming to America: Mercedes AMG Driving Academy, complete with SLS". Autoblog. ^ The numbers do not precisely align because the Mercedes production post was published after all cars were manufactured but before the last several were shipped and then sold. ^ a b "The new Mercedes-AMG GT: Driving performance for sports car enthusiasts". media.daimler.com (press release). September 9, 2014. ^ Topspeed (http://www.topspeed.cars), April 10, 2015. ^ GT Spirit (http://www.gtspirit.com), March 10, 2015. ^ "The new Mercedes-Benz SLS AMG GT Final Edition: The ultimate super sports car," Daimler (Affalterbach), November 20, 2013. ^ Jeremy Clarkson, Top Gear, YouTube, posted February 8, 2012. Wikimedia Commons has media related to Mercedes-Benz SLS AMG.